On the 5th March, 1981 (the 64th day of that year), I became a Master, or 'Si-Fu' (師父) (pronounced: See-Foo), which is equal to a 5th Degree Black Belt, which is worn as a 'Red Belt' in Chinese martial art. And, on the 22 February 1981, I graduated as a Doctor in Chinese Acupuncture and Natural Therapies. By becoming a Si-Fu, gave me the right to become the Master of my own school. . . and I named my school Wu-Chi Tao (無極道); after the great principle 'Wu-Chi', which is over 5,400 years old. Wu-Chi translates in English to 'Unlimited Ultimacy' – and when coupled with the word "Tao" to form Wu-Chi Tao it represents "the road to the epitome of excellence" in any field of achievement. Red Belt is the last 'gradable' belt in Wu-Chi martial art. After a Wu-Chi student has attained the level of Red Belt (5th Degree Black Belt) they are no longer graded by anyone, for they are the Master of their own school. To attain the next level (a 6th Degree Black Belt), a Wu-Chi Master must train a student from scratch, to become a 1st Degree Black Belt, or of an equivalent rank; and likewise, by training a student to the level of 2nd Degree Black Belt proves a Wu-Chi Master to be a 7th Degree Black Belt; and so on, until a Master takes someone all the way through to their Red Belt (5th Degree Black Belt) wherein they too become a Si-Fu, and Master of their own school, totally autonomous from the Wu-Chi school in which they were trained. Any Wu-Chi Master who trains a student to also become a Master like himself, becomes a 'Grand Master' (Lao-Fu) (老父). And the rank of a Grand Master (or Lao-Fu) is a 10th Degree Black Belt, which is worn as a 'Gold Belt'. By October 1987, I had trained ten 1st Degree Black Belts, and two 2nd Degree Black Belts in Wu-Chi (as seen in the photo above). In September 1996 I become a Lao-Fu (Gold Belt), which made me not only a Grand Master (a Lao-Fu) (老父), but a proven Yuan-Fu (源父) Originator of my own Wu Chi Tao (Wu-Chi way, or system). And, this is how it is meant to be in the "Tao" (or the way) of Wu-Chi... as it continues to be, with all those who have been taught to the level of Si-Fu in our school. Hence, our school is called: Wu Chi Tao. As it stands today (Sept 2008), Wu-Chi has produced five Si-Fus (Neil Cameron; Wipere Ngata; Rob Wright; and recently, Bob Margets and Barry Thomas), and it has another three students moving up through its upper ranks, who will also become Masters of their own schools in the very near future. Philosophy (which simply translates into: learning how to utilize all things in life to obtain a higher level of personal development and integrity). Martial Arts (obtain 1st Degree Black Belt, or the equivalent, in at least three (3) "other" forms of Martial Art). Medicine (Acupuncture; Herbs; Bone Adjusting; and Muscle massage with applied kinesiology). The four essentials (Public speaking; Writing; Math; and Science). 10 Talents (any of their own choosing, eg: Sewing, Cooking, Carpentering, Horticulture, Art, etc., to name only a few). FYI: The Wu-Chi School of Arts "martial art content" I made up from eight Chinese 'mother' martial arts (classically called the 'eight ultimates' - Pa-Chi); which in the Wu-Chi School of Arts, are learnt and used both collectively and separately. The eight arts are (in no particular order): Wu-Hsing; Tan-Tui; Hsing-I; Chi-Kung; Nei-Kung; Shuai Jiao; Pa-Kua; and Tai-Chi. The day I graduated as a Doctor in Chinese Acupuncture. Please Note: In writing this account of what has been such a big part of my life over 40yrs, I have only touched lightly on the major events. . . detailing a few of the more memorable times; and adding a few funny things that came to mind, in an attempt to make it all somewhat palatable. Many things I have glossed over, or left out altogether, because I felt that they are either better not mentioned, or they involved people that I did not feel I had the right to speak about publicly. However, having said that, writing this has been one of the more enjoyable things that I have done lately - bringing to mind so many good times and great people. Throughout my youth (aside from hunting/shooting and riding motorbikes - both of which I grew out of in my early adulthood), there were two great things in my life that I lived for - one was Rugby (especially whenever I played halfback), and the other was Martial Art. However, during my high school years I played less and less Rugby, and I went full-on into Martial Art. . . mainly due to my being banned from playing rugby as a disciplinary measure - which in my case, became so regular that my rugby virtually became a non-event. When I was 7 years old, myself and five other boys from Manutuke school, started learning a combination of boxing, judo and karate from one of the older boys from my village, whose name was Bo Matete. I took to combat like a greyhound does to running. From the very first day I really excelled in it, and as a kid I absolutely loved it. I think it would be fair to say that throughout my youth I was extremely competitive by nature.... And as terrible as this all sounds now; when it came to fighting, there wasn't a competition that I didn't enter, nor a person I wouldn't fight. I just loved pitting myself up against the next guy. And being full of youthful ego and vanity, I remember delighting in the intelligence of my own hands compared to the dumbness of the hands of those whom I won over. Not that I always won every fight I fought (far from it), but with those to whom I lost, my youthful ego ensured a rematch was inevitable. Looking back on it all now, I think the thing that drove me the most in those days was that I hated being afraid of anything, and whenever I was afraid of doing something, I would just keep on doing it over and over until the fear went away. . . which, I guess, in itself wasn't such a bad thing - however, when applied to being afraid of fighting or hitting someone, it didn't lend itself to developing many merciful attributes during my youth. About 6 months after I started learning from Bo, his uncle, Sammy, came and stayed at his house. Sammy had been in the army and had learnt Chinese Karate (Kung-Fu) from Chinese martial artists in Malaysia and Singapore, where he had been stationed for 6 years. Sammy loved martial art combat. He was slightly smaller than Bo, but his knowledge was broad, and his techniques were fast and executed with absolute precision, for which Bo was no match. Needless to say Sammy naturally took over our little training group. This was great for us kids, as now we could watch and copy two big people training together, whenever Sammy trained Bo. Anyway, our small training group was soon to be brought to an end. A little after 12 months from Sammy's arrival, came what seemed to me to be, in my youthful life, an extremely sad day - Sammy went to Canada to live and work in the forests. After Sammy's departure I lost interest in training under Bo. Aside from missing Sammy's caring method of teaching, Bo was now 19 years old and was into girls and parties 'n stuff, and had lost any real interest in us - and as a result he had little patience with us and was starting to treat us roughly. Plus, through Sammy, my eyes had seen better things than what Bo was now starting to focus his combat skills upon. Anyway, soon after Sammy left, Bo also left, and went to live in Auckland with his girlfriend, and that was the end of “The Little Willow Tree Company”, as Sammy called us - a name which "us boys" all thought was sooooo cool! This was the real beginning of my training under 'Chinese' teachers in the martial art world. After approaching Kee and showing him all that I had learnt, he agreed to teach me, as long as I agreed to adhere to certain stipulations. We met every other evening in the old tractor shed by the bamboo plantation at the back of the garden. . . and I trained everyday at home - on the river bank along the back boundary of our home property. Soon after I started training with Kee, he introduced me to a small group of Chinese with whom he trained; and I became a fellow student with him, as well as continuing my training under him, for about six years. I went on to train in every good martial arts school that I could find. 'Kitsu-Go' under 'Owen Pool', a top student of 'Pop Adams' who was a European raised in Okinawa, a Master of Goju Ryu - an Okinawan form of Chinese Karate; Tai-Chi and Tan-Tui - which is Chinese kick-boxing, from Mrs. Leoung, a famous teacher in Wellington; Tong Long (Southern Praying Mantis) from the Lee brothers in Auckland; and Southern White Crane from Master Fong in Auckland (naming only the major ones). Chin was a tall man with big hands, and he was loved by every kid in the neighborhood. He was, without doubt, the greatest Chinese martial artist ever to come and live in New Zealand. He was looked up to by all the other teachers with whom I trained. Apart from his Martial Art skills, he was a brilliant man, and a great helper to the NZ Chinese community; especially with their legal matters. He essentially was a Finance lawyer. He spoke seven languages fluently, loved English poetry (Rudyard Kippling especially); and he was a doctor of Chinese and Western Medicine. He was born a twin. Before the communist takeover in China, he was a Professor of Foreign Law at the Peking University. Upon Mao taking China he fled to live far away in New Zealand, after the extensive counterintelligence role that he and his twin brother played for the West against the communist up rise. At one stage I moved to Wellington and lived with Chin for almost 2 years - learning from him one-on-one for an hour and a half every morning at first light, and 2 hours every evening, as well as attending both his private and 'very' private class during the weekends. Both of which he often allowed me to teach in; which I remember, at the time, was the greatest privilege ever. I loved training under Chin, and I hold the highest regard for all that I learnt from him, and I am still thankful for all the time he had for me. He had a profound influence upon my life. Apart from him teaching me martial art and medicine, he taught me to love law, and opened my eyes to its place in building and maintaining modern societies. I still have the uniform that Chin made me when I was 10 years old. It was all hand sewn. He even made the original buttons for the top out of layers of canvas soaked it a white paint-like substance that dries very hard. I designed all the pants for the Wu-Chi teacher's uniform from the ones Chin made me, in honor of him. Plus, I have made myself a sort of 'Hip-Hop street version' for everyday wear - because they are just so darn comfortable. I would have to say, aside from Owen Pool, Chin is the one teacher who had the most influence in lifting my mind above my natural desire to study martial art as a means of fighting or gaining advantage over others. He was the one who showed me how to use it (along with everything else in life) ultimately as a tool for obtaining mastery of self, and teaching others how to do likewise - the former of which was a very big thing for anyone to accomplish with me at that time, especially considering the young, competitive and egotistical nature I had in those days. To give you some idea - the core of Chin's philosophy was simple: he maintained the use of conscience at the point of every decision (which essentially was the same as that which was upheld in my home by my father. My father was a great believer in living unto all that is in your conscience.) Chin also believed that despite what any individual knew, or didn't know, it is the values that they hold within that make them into the person they really are; and he taught that the experiences that one has in one's own life are better to draw guidance from than those found in the scripts and scrolls from some distant teaching. . . . However, above all else, Chin was the one person who taught me to re-evaluate and appreciate the love and wisdom of my parents, which I had lost sight of for a period during my adolescent years. In fact, looking back at it now, I realize that I was so well received by Chin largely due to how I was brought up at home. Chin had learnt the larger part of his martial art in Peking under a man affectionately known as 'Old-Man Arn'. Old-Man Arn's family were professional trainers of hand-to-hand combat and weapon fighting skills for over 15 generations in Peking; and were often called upon to train members of the Imperial Guard and Army. Old-Man Arn had a son, who was simply called 'Arn', to whom he taught all that he knew about Martial Art and the ways of training of the Imperial Guard. Arn was a great Martial Artist, in many respects far greater than Chin (taking nothing away from Chin, as Chin was a senior student to Arn in his father's school. In fact, Arn's middle name was 'Chin' named after Chin). Arn was a Captain in the Cavalry, and fought for the entire duration of the war against Mao. Therefore, he had to flee China to live in Taiwan after Mao's takeover. And, Chin had a younger half-brother (who was much younger than him), called 'Little-Chin', who also fled China, and lived in Taiwan at the event of Maoism. Now, NZ-Chin had written extensively over the years to both Arn and Little-Chin about me and my training with him in New Zealand; and before NZ-Chin died, he made Arn and Little-Chin promise that, if ever the opportunity came about, they would finish my training. Side Note: Soon after I left high-school I had business dealings (both in NZ and overseas) that afforded me time to pretty much pursue any interest or opportunity that I desired. . . So, in 1978, when certain members of the NZ Chinese Society heard that the 'Taiwanese Kou-Shu (Martial Art) Association' were sending out scholarships to western countries for select martial artists to come and learn in Taiwan (as part of a Taiwanese international relations campaign) I was instantly nominated. And, in all honesty I would have to say that it wasn't so much my martial art ability, but more the correspondence that took place between NZ-Chin's friends here in New Zealand and the Heads of the Taiwanese Kou-Shu Association (many of whom were friends of Arn's and Little-Chin's), that ensured my selection (true to Chinese style!). At the time, my offshore business ventures had just started to take off, and as much as I relished the opportunity to have what would be termed 'the ultimate opportunity' of anyone's Martial Art pursuit, I remember I initially looked at going to Taiwan as being more of an opportunity to expand business, rather than anything else. However, once I got to Taiwan, my childhood love for martial art, coupled with the respect I held for all that NZ-Chin had taught me, quickly changed my priorities. Not that I didn't pursue business interests in Asia while I was there, but once I met Little-Chin, and then Arn. . . I realized that this was a 'once in a lifetime opportunity' to learn such things (and to complete what I had begun years ago), and therefore I really threw all that I had into it. I would have to say that the time I spent training in Asia was truly the most fulfilling years in my youthful life. I lived with Arn for the first 12 months, and I trained with both Arn and Little-Chin every day that I was in Taiwan, in addition to the everyday instruction provided by the teachers from the Kou-Shu Association; many of whom were truly great teachers. However, having said that, on the other hand there were some weird and colorful characters from the Kou-Shu Association who were not so great . . . ranging from those who were devout practitioners of bizarre religions, to those who were into any and every form of supernatural or esoteric ideology imaginable - needless to say, these schools I spent little energy in. Oh yeah! Get this - I was even introduced to a school whose Master advocated that one could increase one's so-called 'vital-energy' (chi) by hanging a brick from one's testicles for varied lengths of time everyday. I gained exemption from his school, and courteously ventured on my merry way without my vital-energy being increased under his auspice - "There aint no way anyone was going to hang a brick (or anything else for that matter) off this puppy, I can tell-ya!" Then of course there were those teachers within the Kou-Shu Association who didn't agree with a foreigner being given so much access to instruction . . .
And then there was the day when they found out (through some of them going to the cinema) that Howard and I had been staring in martial art movies - to which my counter argument was - that if it was alright for them to watch the said movies, then surely it was alright for us to act in them, which pretty much went down like a lead balloon! The day before I left NZ for Taiwan. Photo taken for local newspaper article. Very good friend Howard Lee, an Amercian born Chinese - from New York. 22 Feb. 1981 the day I graduated as a Doctor in Chinese Medicine. Anyhow, after making it through all the controversy and politics coupled with all the personal differences within a multi-faceted organization such as the Kou-Shu Association; and after sitting my final grading, which was a 3 1/2 day long event. . . on the 5th March 1981, I became a Master (Si-Fu) and thereby gained the right to be the Head of my own school, and to develop it as I saw fit - totally autonomous to any other school or teacher, master, or system, etc. That was a very special day for both Arn and I. It finished with him giving me his family name - which was a special request of NZ-Chin's, to both honor Old-Man Arn, and to repay Arn for carrying his (NZ-Chin's) name. So my Chinese name now is, 'Arn Chin Sheng' - signifying 'the Life of Arn and Chin' (Sheng means - spirit). However, I did not take this name up until I became a LaoFu, as I did not feel worthy of it until then. Previous to this day my name in the Chinese martial art community was 'E-Bai Ma', which means, 'One Hundred Horses'; but the old ladies in the Chinese community called me 'Kan Chin Tsun' which means 'Sweet Piece of Gold', which sort of stuck when I lived with NZ-Chin. In 1975, in New Zealand, I started part-time experimental courses using martial art as a vehicle to teach moral values and ethical conduct. By 1980 I developed the ‘Wu-Chi’ concept into a working module, and a year later I founded the Wu-Chi School of Arts, while in Australia. 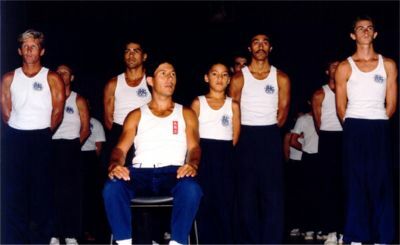 In 1981 I opened the first public classes under the name of Wu-Chi, teaching an initial group of approximately 180 students. 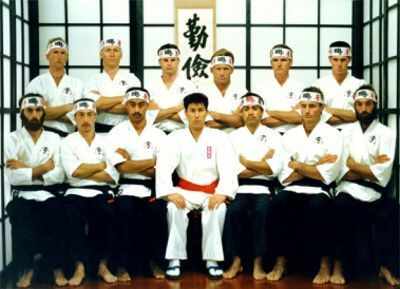 In late 1984, I set up the first teacher training course (named Shao-Men Sarn) which, in the first three years, 48 initial trainee teachers learnt how to use martial arts as an agent to teach character development. During the following years I opened over 60 classes in different communities in Australia and New Zealand. In 1981 I opened the first public classes at the Burleigh State School on Sunday mornings. I also ran a private school, with classes on Saturday night, and selected nights during the week, in a little 'Do-Jo' (training hall) that I converted out of an old bakery at the back of number 1969 Gold Coast Highway - behind what used to be the 'Hot Stuff' surf shop then, just north of Burleigh Heads. Adjoining my Do-Jo I had a little acupuncture and natural therapies clinic. When we (Waimarie - Clint's mother, Clint and I) first lived in Australia, we rented a flat upstairs, behind Hot Stuff surf shop (which was great, because it was close to the Do-Jo and my initial clinic). Later, I had a work office upstairs in the Old Burleigh Theatre Arcade, which is in Burleigh township itself. My acupuncture and natural therapies clinic soon grew into a college, which caused me to rent extra units in the Old Burleigh Theater Arcade, - which doubled as the administration and private training center for the Wu-Chi School, due to it being fitted with removeable screens. From its beginning in Burleigh Heads (QLD Australia), the Wu-Chi School of Arts expanded, first in Australia and then back to my home town in New Zealand (Gisborne); and lately into USA, Germany; and this year we open our first school in Japan. (Selling martial arts to Asians - Not to bad for a Manutuke-boy. November 1981, teaching Tai-Chi at Burleigh State School. This is where the school initially started. We worked on developing the Wu-Chi curriculum and the plans for Wu-Chi expansion project in the upper floors of a block of shops in the main street of Gisborne, which we painted out and converted into offices and facilities to suit our needs. Our guys couldn't decide what color to paint its interior, so I ordered up white - and thus the place was given the nickname 'The Whitehouse'; and the brain-storming board room (depicted in the photo) was called 'The Boardroom' because of the wall-to-wall blackboards. We all gave whatever spare time we could afford in the evenings and the weekends to develop the project. . . And for those of us who could afford it, worked full-time on the projects. At the end of the day, it was a whole lot of 'fun-work' for us all. I created the Wu-Chi School of Arts to be a non-profit community aid service, that uses martial art as an agent to make moral principles and character development attractive to young men - especially those who would ordinarily develop an abusive and violent mentality. The school is designed to attract both the rough and tough as well as the weak and shy male youth. Its ability to do this so successfully is attributable to its hard and fast martial art content, which makes it an activity young men wish to be associated with. In fact, young men who want to be tough are attracted to hard and fast martial art, and therefore they actively seek us out . . . We then engineer into their lessons aspects that provide them with opportunities to gain moral stability and self-discipline. . . And, it is not considered, even by them, foreign or out of place to have to become respectful, self-disciplined and highly principled in order to make it up through the ranks of a good martial art school. In fact, in such an environment, they picture themselves becoming quite profound, and therefore they are eager to adopt high standards for themselves, both within the classroom and out in the streets . . . giving us artistic license to incorporate ever increasing levels of moral and social virtues in all their classroom material, as well as in their gradings. Consequently, within a relatively short time, they become responsible and conscientious citizens. Expansion wise: we are planning to position both of these Schools (Wu-Chi and StudioOne) in the society of modern day youth, much the same as the Boy Scouts and Girl Guides were positioned during the 1950's and 60's. Now, before I start to talking about the schools history and some of the hard-core physical combat aspects of the school, I want to give you a little more insight into the main aspects that I constructed to form the core of the Wu-Chi School of Arts; in order to give you a more balanced view of the school. So, I have excerpted from the School's Constitution these next six bullets. - Pre-empt the need for rehabilitation schemes - by providing character development programs for children and youth before and during the years when they are most likely to be led astray. - Break the cycle of anti-social behaviour and street violence - by producing students who will be positive role models, having a stabilising influence amongst their peers in the community. - Attract the violent and potentially dangerous members of society to give them an opportunity to develop moral stability via an activity they wish to be identified with. - Create classroom environments where students are confronted with situations that exercise and develop their ability to make sound decisions based upon ethics. - Have within our course content, material that will interest individuals in pursuing physical health, mental well-being and moral integrity - to the point where they are able to self-perpetuate their own personal development - aside from the School. - Create and maintain practical strategies to bring our programs within the reach of all people - regardless of their social or geographical position throughout the Western world. We use our martial art to bring identity to personal development. As soon as possible we take our students to the place where they can stand, independent of the school, having the strength and confidence to fulfill their highest ideals and aspirations. "When you point out an object of great importance to a friend, your finger has significance only until the object of interest is bought into their view and they have gained their own appreciation of its value." Accordingly, we use our martial art programs to draw attention to character development. As soon as the character development is brought into view and the students gain their own appreciation of its value, the martial art loses all significance. Hence, we see our school as being only a stepping stone in the lives of those that we interest in higher things. b) Hold the younger maturing students interest - until they too go beyond the point of desiring to learn to fight. Looking to keep a high degree of combat training within the school, I developed what we call the 'Electric Corridor' - wherein, 20 to 30 students stand in two lines to form a corridor; and each student takes turns at fighting their way through the corridor, attacking and being attacked by each person as they travel through. And upon reaching the end, they then become a member in the corridor for the other students coming through after them. The tri-photo here depicts those in the corridor using leather focus mitts, which is just for demonstration effect; as usually it is played open handed. To raise the level of intensity, instead of meeting a single person at each point within the corridor, we position 2 or 3 people at each point - meaning as they come through the corridor they have to deal repetitively with multiple opponents. For beginners the choice of hit-combinations are confined, however the senior grades run freestyle. We usually train the corridor on a country road, or on a beach, and run it for 2 or 3 kilometers without stopping. A good team can have 4 or 5 students following each other at any one time through the corridor, which drives the corridor along at about 1 to 1.5 kilometers per hour (roughly 2k in 100 minutes - giving each student thousands of encounters per hour). This not only raises their level of combat fitness, but greatly improves their techniques and overall confidence. Our whole concept of combat is very different than most. In a tournament using the style of combat we use in Wu-Chi, if a fight were to last for longer than 3 seconds, both opponents would be instantly disqualified for being incompetent. When developing Wu-Chi I chose not to adopt the 'in and out' concept ('attack, then quickly retreat' concept) that is common in boxing and most martial art styles, and chose to develop the physical components upon a 'in or out' concept ('attack without retreating', or 'don't fight at all' concept). To give you an example of our attack aspects: In Wu-Chi combat, we face-off anywhere from standing literally toe-to-toe with our arms folded, and explode into each other without reserve; to standing at 8 paces away from each other, and propel ourselves at each other to engage at about 7 to 10 kilometers per hour. . . either way results in one standing and the other instantly not. There are arguments for and against the win-all/lose-all attack concept that we have developed. Those against it maintain that, if we were to miss then they will have us, but my argument is, "Can they afford to take the risk", especially when considering that all we train (over and over) in every class is to go forward and take the opponent right out immediately. I remember telling Arn once that I had met an exponent of staff fighting who, if he dropped his staff during combat, could flick it back up off the ground from any position with his feet and catch it again. To which he asked, "How long did the exponent say it would take to learn this skill of his?" "8 years", I said. To which he retorted, "Better to spend 8 years learning how not to drop your staff, rather than how to pick it up should you drop it." Over the years I have had a few people come and challenge some of the students in the school - but due to our style of fighting, we have never had anyone come twice. Another example of our revolutionary inventions is the 'Wooden Pads' - or 'Wooden Focus Mitts'. When we only had the ordinary Leather Focus Mitts it was difficult to demonstrate that our method of hitting was superior to any of the other more widely accepted methods of punching. So, I came up with the idea of making focus mitts out of solid laminated timber beams. After a bit of perfecting we came up with the perfect model, which most simulated the curves and weight of a human head in combat. This then gave us the means whereby we could prove the power and speed of our palm and hammer type hits, in demonstrations, and in our introductory classes. We now use these wooden pads in all our public demos; and we offer $1,000 cash (in $20 bills) to anyone who can come out of the audience and punch the wooden pads, as hard as they could hit the leather ones, with their bare knuckles for 5 minutes and enjoy it! So far our $1,000 has been safe. In fact, we haven't even had anyone try with any real vigor; especially after seeing our guys lay into the wooden pads full bore. I found that most of the students that came into our ranks, were attracted to our unique methods of entering in on an opponent and our scientific approach to combat . . . but when it came to recruiting the real tough male students, it was the Wooden Pads that produced the deciding factor, above anything else that we showed them. Aside from their demonstration qualities, the Wooden Pads hold a major place in training our students to perfect all the major hits we use - if they cannot play them on the wooden pads, then they require further instruction. After developing the Wooden pads, we went on to make 'Wooden Dummies' based on them. One called 'Old Bessie', which is bolted to the wall with 4x2 timber, and is designed to increase our 'knockdown' hit power; and R2D2, which is designed to increase the power of our 'finishing-off' blows. Both dummies are seen in the adjoining side photos. However, we still use Leather Focus Mitts for the Kids classes, and the initial classes for women (as seen in the adjoining photo of a high school girl student demonstrating)and we use the leather pads for the guys to train a few selected hits - such as a single knuckle punches, etc. And many of the other training aids we've developed are not founded upon rocket science, as in the case with training stick fighting by using an old car tire as a mobile target. And, in some of the classes on the other end of the school (such as in the Tai-Chi classes) there are no pads or combat training at all. This is a copy of the advertisement that I ran in Gisborne when we first opened the school in Gisborne, in 1988. I first open a children's class, and a 'women's only' class, about three weeks before I run this advertisement. . . The idea is to open up the kids class with a minimal amount of advertising, from which I attract an initial group of kids, say about 50 kids; as well as a small group of mothers wanting classes - most of whom are seeking either fitness or self-defense. Then once the women's only class is up and running, I proceed with extensive advertising for an 'All men's Class'. Similar to that pictured here - featuring a highly masculine image - with the words, 'Men Only' and other phrasing that clearly states no women would be admitted. This causes a barrage of phone calls and visits from women who have strong feminist qualities. Whereupon they are informed of our all women's classes that are already running, wherein no men are admitted. . . which they usually join. And, because of these women's strong tendencies to be leaders of other women, when they join up they each bring, on average, four or five other women with them. Consequently, within 6 weeks, we end up with a full women's class. And then after teaching them to hit very hard and fast, they naturally show off to their husbands and men folk what they have learnt - which causes exposure of the school to a wide spectrum of the community, and thereby maximizes the intake in both the Men's and Women's classes, which results in the kids class dramatically expanding. Most of the men folk that join the school at this stage are generally good guys - most are interested in just a bit of fitness/self-defense and doing a real guy's thing. . . and they form the nucleus of the initial men's class. Then once we have trained them up for 4 - 6 months, we go after the really tough and potentially violent guys, with demos and classes that are highly attractive and challenging to their type of egotistical mentality. Once the school's culture has been thus set up, the rest is just a matter of steering it, which can be easily managed by steering committees - which are made up from students, chosen by us to ensure that a good cross-section of the local community is represented. From here the school branches out into opening up classes in surrounding areas, and into providing additional services. We developed the Wu-Chi School of Arts to have a smorgasbord of classes so as to attract the broadest rage of people from within a community. People ranging from school children, housewives, aircraft pilots, etc., through to some of the most troublesome male members of society. In fact, in Gisborne (which is one of the most problematic gang areas in New Zealand) we had Police and gang members training together. It is a rare thing to have gang members even enter an establishment that is known to be frequented by Police, let alone to have them fully participating in a common interest for long periods of time. The school always takes extra time to invent different ways to reach the more problematic groups within a community. We are constantly repackaging our curriculum and classroom environment so that we are attractive to such groups. As in the case with one particular gang, we altered the uniform for their class to include a black t-shirt and a special black Wu-Chi gang-rag style bandana, giving them a new 'Patch' to wear that is associated to a whole different set of values. The group in this photo is a gang in the Gisborne East Coast area, taken during the last section of their training (under SiFu Wipere). And I find that the changes tough guys make in their lives are usually are true and sincere, resulting in them becoming the loveliest gentlemen of all. I believe that to be a good teacher in Wu-Chi all you need is skill, a little luck and a whole lot of love, and you end up with the magic mix that pretty much works for anyone. I would have to say that the Wu-Chi Karate kids classes were my favorite. On average I had about 100 kids, aged from 6 to 11 years, in those classes. . . and much to their parents amazement, you could hear a pin drop for the 50 minute duration of their class. For most of the kids, Wu-Chi would have to be the most disciplined environment that they had been exposed to, and for most - if not all, it is their favorite activity. They are taught that the most important thing to learn in their life is to know the difference between right and wrong, and that having pure intent and to be true in all that they do are the greatest attrubuties able to be aquired in life. Often the parents looking-on from the sideline enjoy the lessons as much as the kids do. One of my favorite objectives in the kid's classes is to give parents extra vantage points with their children, by first inspiring in each child a desire to learn good values and principles for their life; and then teaching them that it is their parents who are responsible to teach them these values and principles, eg: difference between right and wrong, etc. For many children the school hosts the major 'make-or-break' opportunity for their future. Many are from families who are second or third generation welfare dependants; and in some cases both of their parents are gang members. For these kids, we start by running classes in their neighbourhood parks - meeting them in their own local environment, getting them used to our instructors. After which they are content to come into our Do-Jo and environment, which is the first of many challenges they we place before these kids. One of the most rewarding things in this business is watching these kids turn their lives completely around, and become successful to the extent that they have a profound influence upon their whole family and neighbourhood. In my day, on Sunday afternoons the senior ranked students used to run free classes for the junior students, and for those preparing for gradings. In all classes (kids and adult alike) we run the school as a very tight ship. 100% pass mark is required to obtain any grading in the school. The most I have ever failed a student is 34 times (in his attempt at orange belt), and only one student in the history of the school (in my day) ever passed a grading on their first attempt - although, we made him sit it three times on the day, just to make sure that we weren't with fault. Failure is instant if their eyes drop, or if a hand is out of timing, or a foot is out of place. On average it takes around 9 - 15 attempts for most good students to pass a grading. In conjunction with the martial art classes, I ran courses in natural therapies, Chinese & Western herbs, massage and acupuncture. I encouraged every Wu-Chi senior instructor to become qualified in Chinese medicine and to run a Wu-Chi Clinic to provide treatment for the general public. All mid-ranked students were encouraged to learn massage and/or acupuncture. For many of the tougher guys that came to Wu-Chi only seeking combat, having to learn about the workings of the human body and how the different organs depend upon each other for one's overall health, and learning how to care for the sick, created the turning point in their lives. Aside from the benefits that the clinic provided for the Wu-Chi students, it enabled the school to reach further into the community. For example: I ran the clinic here in Gisborne as a part-time business to help fund the school's growth; and every Tuesday afternoon there were free treatments for people over the age of 60 years, or for those who are financially disadvantaged. . . and as one can imagine, Tuesday afternoons were a very busy time. These clinic days were a means whereby we were able to come into contact with senior and poorer people in need within the community, who the school would not otherwise become aware of, and thereby be able to help. Every year, the main School adopted a disadvantaged solo mother, or someone equally in need of help. The school sponsored their education and career start, ensured they had a good car of their own, as well as a residence conducive to their growth. Also members of the school, who were able to, formed support teams in order to provide such things as child-minding, etc., to further help. Instituting facilities, such as adopting disadvantaged people and running a clinic, etc. gives the whole school a community edge that transcends the preconceived boundaries of a normal martial art school. Even at its very core, in its most prestigious and private Teacher Training class (Shao-Men Sarn), we actively maintained an open house to families and friends - as seen here in a photo taken of the main teacher's training class in 1987. With so much of Martial Art having its roots in feudal groups, we take these and many other special measures to ensure that the School is kept before the student's eyes as being a means to help society, and never becomes a means to incite violent behavior. And likewise, with a lot of Chinese martial art schools being associated with monastic societies, we take equal measures to ensure that the School never becomes an occult, or cult, and that it remains neither religious nor anti-religious, or sectarian in any way - but deals simply with developing personal integrity. However, having said that, the School maintained a large martial art public profile, both through the services it provides and through putting on public shows and demonstrations. I think that one of the nicest things for me was the fact that my son (Clint) loved Martial Art during the years that he grew up. Clint started training at the age of three, and was co-teaching at the age of six, and by the time he was 12 he was running adult martial art classes on his own. I am happy to say he has just returned to training again (under Si-Fu Wipere Ngata). One thing I can truly say is that I have always been my son's hero, and I don't think that life as a dad gets to feel much better than that. We are really good mates and we enjoy each others company immensely, regardless of us living lifestyles that differ vastly in many areas of life.
. . . But, then again, I would imagine that, in many respects, having me as a Dad would be somewhat of a very big rock to have to climb out from under. Me today. . . . I am pretty much retired from the School these days - as far as teaching public classes goes. All in all, over the years, counting from the first classes I ever taught, I suppose that I personally would have taught somewhere between 30,000 to 35,000 students, face to face - conservatively speaking. One: as the Yuan-Fu (founder) of Wu-Chi. Wherein, I am "The Keeper of the Art", meaning I am responsible for maintaining and distributing: a) the physical moves that are at the core of Wu-Chi, and b) the principles that make a Wu-Chi school what it is. Also, I am obliged to make myself available once a year, for eight days, to meet and train with the Masters (SiFus and SiMus) of all the Schools. Two: as a Lao-Fu (Grand Master) in Wu-Chi. Wherein, I am the keeper of the neutral or common ground between the Wu-Chi schools of those Sifus who trained under me, when I was a Sifu. In general, my role as a Lao-Fu is more of a patriarchal one. I am an honoured guest at select events, and I'm invited to teach a class every now and then (which is always a real pleasure). Once I became a Lao-Fu in Wu-Chi, I was required to retire; having no school or classes/students etc., in order to make room for those who have graduated through the ranks to control and run their own Schools outside of my control or influence. I am still allowed to teach the immediate members of my family and my wife's family, which is nice . . . as I still get to have a swing around with Clint and Tyrone every now and then. We train together most mornings for an hour in ANZAC Park, which is just down the road from where we live. . . and we write books and instruction manuals for the School, both on Wu-Chi martial art and Acupuncture & natural therapies. These pants are drafted from the ones that NZ-Chin made for me when I was 10yrs old. We usually train for 2 to 3 hours a day, five days a week. We developing a lot of new Wu-Chi material, which we teach whenever we are invited to schools to teach (whether they are Wu-Chi schools, or other martial art schools), and lately we are formating Wu-Chi material into over 400 instructional videos ready for the Web (which is a big job). I would have to admit that the Martial Art discipline over the years, along with creating and developing the Wu-Chi School of Arts into a community aid service (not to mention developing the Modelling and Deportment school with my wife), has had a profound effect on my life. And the healthy contact with so many people, spanning such a wide range of the community, has over the years given my wife and I a very fulfilled life. However, please know that I have a life aside from martial art. One of my pet hates is to be presented to people as being a "Martial Artist". I find it makes a change to their perception of my life, to the point where every conversation begins and ends with martial art - which leads to some of the most abnormal conversations imaginable, to say the very least. And please don't buy me any Martial Art books, Bruce Lee posters, or take me to Martial Art movies - or any other RUBBISH like that - unless of course you want to watch me throw up; because I can assure you all that at heart I am sooo not into the whole Martial Art "Culture" Thingy! !